No matter how high she built the fire, Tara couldn’t get warm. The sound of the wind whistling and howling around the house chilled her to the bone despite the comforting heat from the fireplace. She shivered and pulled the heavy quilt tighter around her shoulders. Jason had been so excited to book this cabin for the week so they could celebrate their tenth anniversary. Of course, their actual anniversary was a little more than two months away…but the rates for the cabin were more than double in June so they were celebrating a little early. 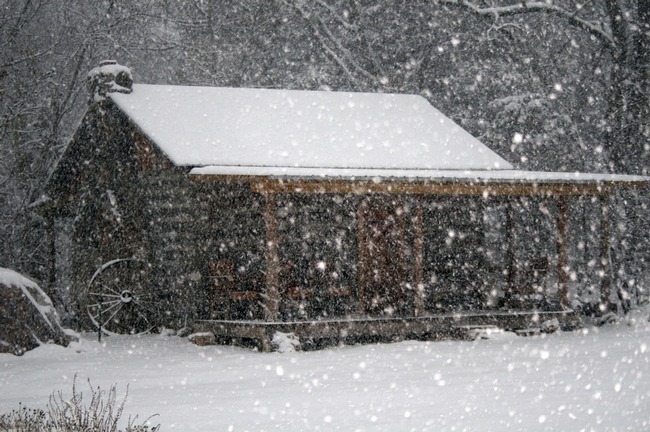 Tara looked around at the small windows along the front of the cabin and listened for the sound of Jason stacking firewood on the porch. The property manager had made a point of mentioning the storage building full of wood when they’d picked the keys up, and now she knew why. Jason was going to be freezing when he came in. She shivered again and stood up, gathering the bottom edge of the quilt up to avoid tripping over it—the gleaming wooden floors were tricky enough to navigate in three pairs of socks without stepping on the quilt. He’d appreciate some hot cocoa when he came in, she thought. She opened and shut four cupboards before she found the pots and pans. The water burbled a bit coming out of the tap before it steadied into a solid stream. It was ice cold, and it occurred to her to wonder how cold it would have to get to actually freeze in the well. She filled the pot and gingerly shuffled across the kitchen to put it down on the metal trivet covering the burner. Some maneuvering had the bottom of the quilt under her feet for warmth, and she turned her attention to the stove. It was gas, and much older than her stainless steel electric one at home. Careful to keep the quilt back from the stove top, she turned the knob for the closest burner. There was an immediate hiss of gas and the unfamiliar smell of rotten eggs…but no flame. Tara stepped back and bent to peer at the burner, trying to troubleshoot the problem. She turned the knob back to the off position and considered the stove more closely. Maybe you had to start it on low and let it warm up? She turned the knob to what she presumed was the lowest setting. The markings had long since worn off the face of the stove, so she couldn’t be certain, but the hissing wasn’t as loud. And still there was no flame. She turned the knob back until the hissing stopped and then stared at the stove. The quilt slid down her shoulders, forgotten in her frustration. “OK,” she said, and jumped a little at the sound of her voice in the cabin. This is ridiculous, she thought to herself. I troubleshoot some of the biggest networks in the country. Surely I can figure out one antiquated stove! Reaching out she snapped the knob to the middle setting and frowned as the now-familiar hissing and smell failed to produce a flame. In a burst of irritation she slapped the knob with the flat of her hand, and jumped back at the series of pops that ignited the escaping gas into a dancing ring of blue flame. “Huh! What do ya know about that?” she murmured, and took a closer look at the knob. A cautious clockwise lowered the flame, and a more confident counter-clockwise turn raised it to lick at the bottom of the pot. Not willing to risk the flame heating the water, Tara moved to the working burner’s mate and turned the knob. Watching the burner closely, she pushed the knob in and was rewarded with another series of pops and a dancing ring of flame. She smiled and flicked the knob off. By the time Jason stamped his way through the front door, followed by a blast of frigid air, she was pouring creamy hot chocolate into two mugs. I wrote and posted this short story last year, but I'm resurrecting it for the Write On Edge prompt this week...just because it fit SO well! Thanks for stopping by, and please feel free to leave a comment so I'll know you were here! You're right to resurrect this, it was perfect for the merge prompt. I find your posts delightful as always. Well done! Never underestimate gas stoves! They can be so stubborn! ;) Nice writing! I was feeling a little trepidation about this story ... fearful that there would be some horrific end to a potentially sweet get-away. What a relief that it ended so sweetly -- whew! I was feeling her frustration, I use to get the same way when I would try to autopilot the gas stove in our trailer. I always needed coaxing. I was preparing for a loud explosion! Good thing she got it. The details made this story pop. I love this! Great details and contrast between the snowy, cold outside to the warmth of the hot chocolate. Good read! you set a great atmosphere with this! Lots of great sensory details, great job! It made me shiver just to read about the cabin; great little scene!